← Book Review: Hounded, by Kevin Hearne. Iron Druids ‘n stuff. Yep, I’m proudly back on track today. Don’t ask me how many pages I edited, because I’m not concerned with quantity right now. I’m just taking my first bite of the elephant in over a week. I’ve done a lot for work today. 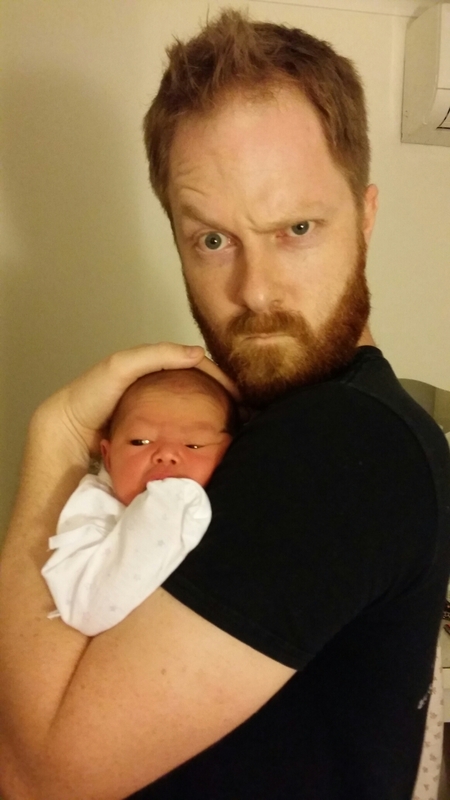 I’ve done a lot of fathering today (no NOT making more babbies, I mean looking after the current noob). I’ve even done some exercise (admittedly a puny portion… please don’t ask me if I “even lift” today). And now I’ve done some editing of my manuscript. It can be done. Hells yeah. What inspired me to get moving again? Well, I had a look at a good friend’s work a few weeks ago, and I finally gave him my beta-read-y comments. He emailed me back, and seems that some of the brainspew I hurled at him actually helped. Who’d have thunk it? Wish me luck for tomorrow, and may hairy little demons lift your feet and carry you to victory whenever your own writing slumps. Or, you know, you could have unicorns if you prefer. How’s your Work In Progress going? Slumped? Pumped? I’d love to hear your updates. This entry was posted in Writing and tagged children, editing, exercise, fiction, newborns, science fiction, Writing. Bookmark the permalink. The baby’s cute, I’m glad you’re getting back on track, and my book was supposed to be out two months ago, but it’s stuck. Working on it! Have a good rest of the day! Thanks about the bub, all credit goes to my wife’s superior genetics. I kinda think she looks like yoda in this photograph though hehe. Congratulations! Beautiful baby! Hope everyone is well. My own writing is stuck right now, as I’m trying to find a way to illustrate my stories myself. Thinking about making clay characters and photographing them. Thanks. The whole drawing with pencil thing is not going well. If I start talking about using sock puppets, just cyber shoot me. Aw, sweet baby! I’m amazed you’re getting anything done at all. I am so pumped about my book right now! I thought the realization I still have 90k+ words to write before its done would be discouraging, but instead I’m energized and writing like a maniac. Wishing your little one many long and peaceful naps so you can get more work done! I’m probably looking at 175-180K by the end. I can probably cut quite a bit-endless adverbs and pointless dialogue- and finish at around 150-160K. Sounds like you have a lot to cut. Yikes!